Over the last several years Sports Boat racing has forced constant Asymmetric development. The Asymmetric has now evolved into a very useful sail and is a worthwhile addition to any cruising wardrobe. The sail is very efficient on a tight and broad reach, and now, as a result of the development program, it is more usable further off wind. Good use of the adjustable tack line ensures this. Easing the tack allows more of the sail to roll round the front of the boat projecting more area to windward and reducing the amount of sail behind the mainsail. Tightening the tack line allows the sail to behave more like a Genoa, permitting it to sail closer to the wind. The sail is extremely easy to handle, particularly if used with a snuffer. It is hoisted in its sock on the spinnaker halyard and fixed at the tack, when the crew are ready with the sheets then the snuffer is raised and the sail set. To drop, the sail is simply doused with the snuffer and lowered to the deck. There is no pole to contend with and gybing is as easy as tacking a Genoa. There are also various furling systems available for these sails, they work well, although there is a jump in cost compared to the simple snuffer. The Asymmetric is a great offwind addition to the wardrobe. 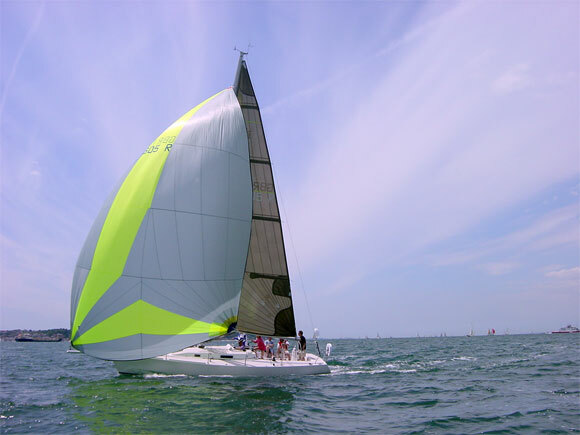 If sailing short handed puts you off using a Spinnaker, then this is the ideal alternative. Selden masts have now brought out a bowsprit, which neatly fits most yachts, giving good clearance at the bow. See their website www.seldenmast.com.